Memory Wire - a wire that never loses it shape. It is also sometimes called "Chain Wire" or "Remembrance Wire". 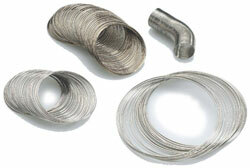 This type of wire is a specifically hardened special kind of wire so that it retains its shape. It is usually sold in coils and comes in sizes for Necklace (choker), bracelets, and ring sizes. This allows jewellery to be made from it - most notably bracelets & necklaces - that can be stretched so that it can be worn fittingly & comfortably and yet will return to its original shape when it is removed. Designers cut the number of coils they want to work with. Usually it is about 3 coils but it is really up to the individual designer and is dependent on the design itself. These memory wires are very easy and fun to use while allowing a wide range of endless design possibilities. Beads are strung onto the wire and the ends of the wire is finished with end caps or ½ drilled beads (half drilled beads). You can also finish a memory wire piece of jewellry with simple loops. You should never use scissors to cut this wire - it will totally destroy your scissors. Due to the special hardened steel used, it is recommended that you MemoryWire cutters to cut them.